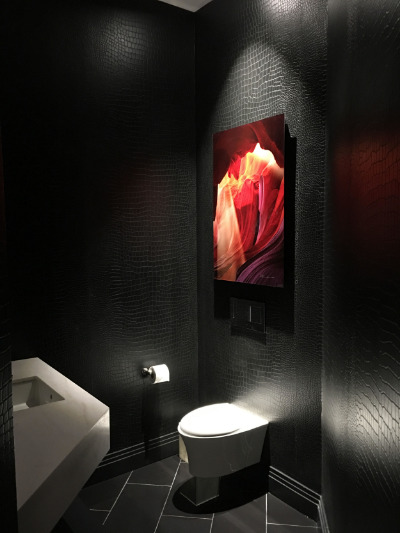 Very happy to post these pictures of the recently completed Davis Residence, a collaboration with Chris Thibodeau. This 3,000 sf gut renovation of a two level TriBeCa apartment was built by Reidy Group, and we are really excited about how it came out, especially the "feature" stair. We are planning on getting this photographed professionally, so more pictures will definitely follow. So last night I taught a new class at the Brooklyn Brainery entitled Great NYC Buildings You Won't Find in Guide Books. It was a 90 minute "lecture" type class, with a good turnout. The wine provided by Jen Messier provided a little needed liquid courage. We started by reviewing some of the architectural styles that adorned the NYC skyline from pre-colonial days to the early twentieth century, as a brief introduction. We looked a bit more deeply at the Beax-Arts Style, and the work of McKim, Mead and White since the first building we looked at was: 130 Bowery - The Bowery Savings Bank Building. 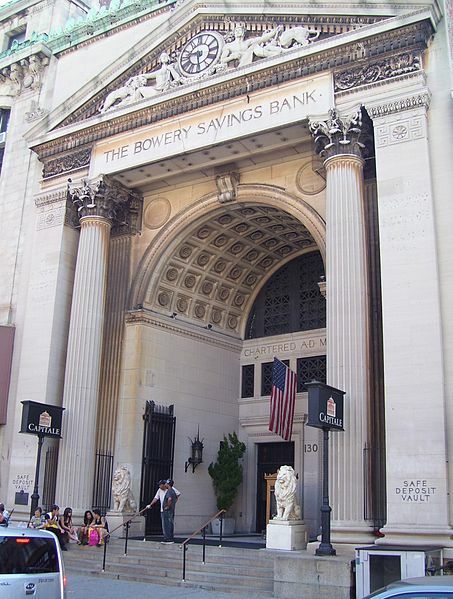 130 Bowery - The Bowery Savings Bank Building, 1895, McKim, Mead and White Architects. Currently used as a high-end event space, Capitale. We discussed the significance of the building in the context of the Lower East Side of the 1890s. We looked at its stature as a bank, and how the architecture was designed to instill a feeling of stability and security in an otherwise unstable neighborhood. We briefly looked at some of the other buildings that Stanford White was responsible for, and how the architect studied under the tutelage of Henry Hobson Richardson, the main influence on the next building we looked at, The Eagle Warehouse Building in Dumbo Brooklyn. The Eagle Warehouse Building, Dumbo, Brooklyn. 1893, Frank Freeman, Architect. Currently used as high-end condominiums. This building I have always admired, originally while on line waiting for pizza at Grimaldi's, but later just as a really amazing building on its own. We looked at how the machicolations ( the scallop shaped ornament found near the top of the building) matched those found at the Pallazzo Vecchio in Florence (originally used for "murder holes" to pour hot oil on an invading force, in Renaissance Florence, not 19th century Brooklyn). We talked about how the architect, Frank Freeman, a great 19th century/early 20th century Brooklyn architect, was heavily influenced by H.H. Richardson, especially in the treatment of the arched entry and the overall composition. We talked about its original use, its current use, and we looked at some of the details found in the building. Next came 360 3rd Avenue in Brooklyn, a building that seems to stand alone on the corner of 3rd St. and 3rd Ave. out of time and out of place. The building was originally known as the Coignet Stone Company Building, and was the showcase for the company's pioneering and patented type of early concrete manufacturing. The surrounding plots have been bought by Whole Foods. But they will have to build around it since the building has Landmark status. So there. Beard & Robinson's Stores, 1872, architect unknown. Originally used to store trade goods bound for New York Harbor via the Great Lakes and the Eerie Canal. Now used as artist lofts and light manufacturing. The Starrett Lehigh Building, 1930-31, Walter M. Cory Architects and Yasuo Matsui associate architect. Originally a freight distribution warehouse building, now a commercial home to some of the most creative businesses in the city. inally, we looked at the Starrett Lehigh building which has always been my favorite building in Manhattan. Its sheer ship-like massiveness, curved corners, continuous bands of curtain wall windows, mushroom columns and vast open interior spaces have always just blown me away. I am lucky enough to be currently working on a fit-out in one of the suites for my current employer, Spector Group Architects. o that's it. The first "Great NYC Buildings Few Guidebooks Will Ever Mention" class is in the books. I'm open for ideas for other buildings in the city that fit this description, feel free to post here or email/tweet/text/call me with your suggestions. Teaching a new class at the Brainery! For my next act I will be teaching a new class at the Brooklyn Brainery titled "10 Great NYC Buildings You've Probably Never Noticed (or if you did, you probably don't know anything about them, unless, maybe, you are an architect or a keen observer of your surroundings)" (I'm still "work-shopping" the title, it's still a bit wordy if you hadn't noticed). Its still in "Beta" mode , but keep your eyes open for it at a Brainery near you! We will look at the history and significance of these buildings in the context of NYC and American architectural history in general. Last night I taught my first Memory themed Architecture and Film class at the Brookyn Brainery. It seems as though there is always a technical malfunction in every class while I set up the equipment; this time, my computer completely refused to turn on (magically, it returned to normal this morning). Thanks to Netflix, I was able to get by by showing clips on my iPad. The content for the class was densely packed with material. We started with a brief discussion on space-time theory as it related to the development of Modern art and architecture at the turn of the twentieth century. This manifested itself in Cubism, Purism, Constructivism, de Stijl and Futurism, to name just a few of the "isms" that dotted the period. We talked about mnemotechnics, and how the "art of memory" (the ancient technique of remembering through spacial indicators) represents a historical precedent for the relationship between architecture and memory. This was a very important theme that manifested itself in both the films and the architecture we looked at in the class. This was followed by clips from Memento (Christopher Nolan, 2000), and a discussion of non-linear, or modular, narratives. Anachronic modular narratives (those that toggle between the future and the past in the telling of a story) "both reflect and respond to changes in our perspectives on time and space, and constitute a valuable tool for analyzing the role of narrative in contemporary culture." (Cameron, p.19) We talked about how Memento takes place in "non-places", architecture of the most non-descript nature. These "non-places" are visual cues to the amnesiatic condition that the main character, Leonard Shelby, suffers from. He is constantly trying to anchor himself in space and time, and has a difficult time doing so, relying on Polaroid pictures and notes to constantly remind himself of where (and when) he is. In addition, the "non-places" lead to a timelessness in the movie as well; though filmed in 2000, there is a lack of contemporary technological aids such as cell phones, recording devices and digital cameras that might help Leonard with his inability to remember beyond 10 minutes in the past. This gives the film a timeless as well as a "place-less" quality which correlates well to the plot and the structure of the film. We then moved onto Peter Zumthor and how he relies on the memory of his personal architectural experiences to influence his work. After reading from his book of essays, Thinking Architecture, we looked at his Brother Klaus Field Chapel, located near Cologne, Germany, and how its unique method of construction lends itself to the idea of memory. We also looked at his Shelters for Roman Ruins in Chur, Switzerland, as well as his Steilneset Memorial to the Victims of the Finnmark Witchcraft Trials in Vardo, Norway. The memorial is inspired by the fish drying racks that adorn the coastline on which the memorial is built. The very notion of a memorial structure is evocative of the idea of memory. We discussed the distinction between the "personal" memory of Peter Zumthor and the idea of a "collective" memory that is inherent in public memorials such as the Vietnam Veteran's Memorial in Washington DC as well as the 9/11 memorial currently under construction here in New York City. Much needs to be ironed out, clarified and expanded upon in this seminar, but I find this subject fascinating and an exciting topic to explore. Please keep your eyes open for updates on the opening of the new and improved Video Free Brooklyn, especially you Brooklynites living around the Smith Street area. One of only about 3 video stores left in the city, VFB will re-open under the new ownership of movie critic Aaron Hillis. The new store will feature Aaron's carefully curated collection of hard to find DVDs and Blu-rays as well as an exciting new make-over designed by yours truly. Soft opening will be this Labor Day weekend.... More to come. Welcome to my new and improved website powered by Squarespace.com.